HDL | What Does HDL Mean? HDL means "Hab Dich Lieb", which is a German phrase indicating deep affection for someone. When spoken in full, "Hab Dich Lieb" is normally used amongst close family members, similar to the phrase "love you" in English. Additionally, the abbreviation HDL is often used as a term of endearment between female friends, but rarely amongst male friends. Although HDL expresses deep affection, it is generally considered to be a more platonic affection than that expressed by the abbreviation ILD ("Ich Liebe Dich"), which translates in English as "I Love You" and is more appropriately used between couples. Karen: See you tonight at 7. Simon: Mum, can I go to Kev's house after school to play for a while? Mum: OK sweetheart. Be home by 7. OK? HDL is an initialism abbreviation. Technically, this means it is pronounced using its individual letters (i.e., Aitch Dee Ell). However, it is not often uttered using its letters, as it is used for efficiency in writing and not efficiency in speech. Between native German speakers, the abbreviation HDL is likewise only used in writing. 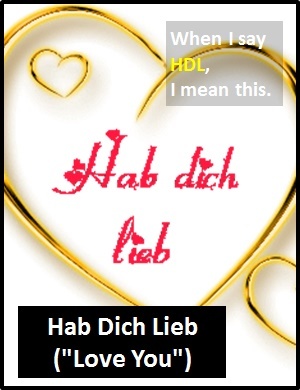 The abbreviation HDL is normally used as a standalone declarative sentence (i.e., a statement) with the meaning "Hab Dich Liebe". HDL is not often used as another part of speech within a wider sentence. Before the digital era, we might have said something like "love You" instead of using the abbreviation HDL.